Second Friday collections are very average and the fall from first friday is huge. Singham Returns has the 6th Highest First week of All time. 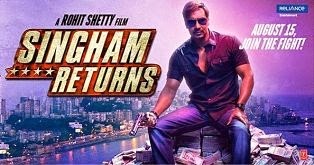 Singham Returns fell from Tuesday onwards especially in North India. It is behind Dhoom3, Chennai Express, Kick, Ek Tha Tiger and Krrish 3 to be 6th Highest so far. It is just ahead of Yeh Jawaani Hain Diwani after the first week. Singham Returns is now 8th movie to cross 100 crores in India in its first week. Singham Returns is 27th movie to cross 100 crores in India. In its weekdays it has been doing decently with slight fall on each day. Singham Returns has the second Highest First Weekend of 2014 behind Kick. This is Highest weekend collections ever for an Ajay Devgan movie while for Rohit Shetty this is second highest behind Chennai Express.